The Fermi 1 nuclear plant, which suffered a partial meltdown in 1966, stands on Detroit Edison property in an undated file photo. The news media took note of Monday's anniversary of the nuclear accident at Pennsylvania's Three Mile Island power plant, but a partial meltdown at another U.S. reactor seems to have slipped from the public memory. Fermi 1, a small nuclear reactor south of Detroit, experienced a loss-of-coolant accident in October 1966. Fermi 1, owned by a consortium of utilities and industrial giants, went into service on leased Detroit Edison land in 1963. It was a prototype fast breeder reactor, meaning it was designed to create more fuel than it consumed. In breeder reactors, a fertile radioactive material such as uranium-238 is bombarded with neutrons to create more potent materials such as plutonium-239, which can be used in typical fission reactors, according to the Nuclear Regulatory Commission. 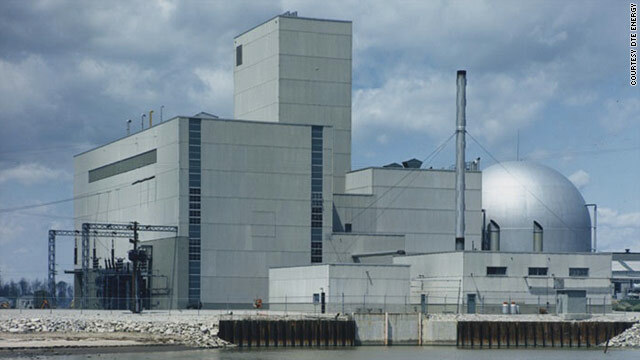 The small, experimental plant was not intended to produce commercial power, generating just 61 megawatts of electricity, said Guy Cerullo, a spokesman for DTE Energy, the successor to Detroit Edison. "That could run a neighborhood," but not much more, Cerullo said. The commercial Fermi 2 light water reactor next door, by comparison, produces 1,100 megawatts. In October 1966, a piece of zirconium cladding inside the reactor chamber came loose. The metal blocked liquid sodium coolant from reaching two of the reactor's 103 subassemblies, each holding multiple fuel rods. That fuel heated to the point of melting. Because Fermi 1 was sodium-cooled, operators couldn't dump water on the fuel to cool it down, as engineers in Japan have been doing at the tsunami-damaged Fukushima Daiichi plant. "You can't shut down easily because sodium will burn if you hit it with water," said Bill Martin, a professor of nuclear engineering at the University of Michigan. "... Sodium and water don't like each other." Fortunately, the melted fuel rods stayed inside their subassemblies, allowing plant operators to carry out an orderly shutdown using spring-loaded boron control rods, Cerullo said. "About 1% of the fuel was damaged," he said. "Everything was contained." Using creative methods and purpose-made tools, engineers fished the loose zirconium plate out of the reactor vessel in December 1968, more than two years after the accident, Cerullo said, citing a 1975 official report. The accident was described in John G. Fuller's fact-filled but somewhat sensational 1975 book, "We Almost Lost Detroit." Fuller is deceased and the book is out of print. Detroit was in little or no danger during the Fermi 1 accident, Martin said. "I think that requires a lot of assumptions that aren't very realistic," the professor said. The damaged subassemblies were replaced, and the unit returned to service in July 1970, according to a Georgia State University online physics forum. Its operating license was not renewed in 1972, and the decommissioning process began. The fuel was returned to the federal government in the mid-1970s, Cerullo said. The unused Fermi 1 building still stands, and the containment vessel is being cut up now, Cerullo said. The utility hopes, in the end, to leave no trace of the building. "The eventual goal is to put it back to a green field," Cerullo said. Filed under: 2011 tsunami • Energy • History • Japan • Michigan • Nuclear • U.S.
Easy to forget, they were cancers. Cancer is good for the economy, increases the GDP, raises the money flowing through the insurance and reinsurance industries, feeds the medical industry and increases the demand for nuclear isotopes. Plus cancer deaths could have been from anything, no one can definitely say who did and who did not die from the accident, so the corporations and their profit-mongers pretend no one did. The USSR did the same thing after Chernobyl, which probably killed a million, the Soviets said it killed 31. Thebes, Chernobyl caused 974 deaths. Period. There MAY be some increased cancer, I'd even call it fairly certain, BUT the total number will NEVER be in the millions.